Spaceflight Now | Breaking News | Tenth planet found! Space shuttle Discovery's seven astronauts arrive at different times on Friday, July 22 at Kennedy Space Center to resume launch preparations. As excitement builds for the first space shuttle launch in over two years, this comprehensive video selection captures the major pre-flight events for Discovery and her seven astronauts. 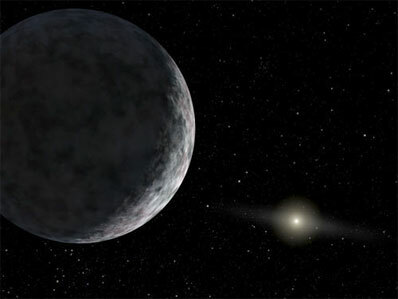 A team of astronomers systematically scanning the far reaches of the solar system has discovered a distant, icy world that is bigger than Pluto but so far away the head of a pin held at arm's length would blot out the sun. The discovery, if confirmed, would force astronomers to re-write their textbooks and give school kids a 10th planet to memorize once a governing body sanctions the still-secret name proposed by a trio of discoverers. Currently known by the catalog number 2003UB313, the newly discovered planet wheels about in an elliptical orbit tilted some 45 degrees to the plane of the solar system's eight major planets, taking 560 years to complete one trip around the sun. At its most distant, the planet is a remote 97 times farther from the sun than the Earth. At its closest, it passes inside the orbit of Pluto at a distance of some 36 astronomical units. It is currently the most distant object known in the solar system, so far removed that its surface temperature is a frigid 30 degrees above absolute zero. "It has a surface just like that of Pluto," said Michael Brown, a planetary scientist at the California Institute of Technology. "It's a little bit bigger than Pluto and the main difference, of course, is it's much, much farther away than Pluto right now, so it's going to be a much colder place to be. Not a very pleasant place to live, definitely. And life as we know it would certainly not be doing much out there." The new world was discovered Jan. 8 by Brown, Chad Trujillo, of the Gemini Observatory in Mauna Kea, Hawaii, and David Rabinowitz, of Yale University, using the 48-inch Samuel Oschin Telescope at Mount Palomar. With a surface dominated by methane, the distant world is 1,677 miles in diameter, compared to about 1,400 miles for Pluto. It is a member of the Kuiper Belt, a broad fan-shaped disk of icy debris extending from the orbit of Neptune to well beyond Pluto. Disturbed by gravitational interactions, primarily involving Jupiter and Saturn, a Kuiper Belt object can fall into the inner solar system and become captured in a so-called short-period orbit. In the early solar system, gravitational encounters also threw large numbers of comets into a vast, spherical shell known as the Oort Cloud. Comets that eventually fall back into the inner solar system from the Oort Cloud typically have orbits measured in millions of years. The newly discovered world is a "very cold, very distant place," Brown told reporters in a teleconference Friday evening. "If you were standing on the surface and you held a pin at arm's length, you could cover the sun with the head of the pin. As I said, it's not a place you'd want to go for a summer vacation. Now, in 280 years, it'll be a lot closer, but it still won't be much of a vacation spot then, either." The size of the planet was inferred by observations of its brightness. "Even if it reflected 100 percent of the light reaching it, it would still be as big as Pluto," Brown said in an earlier statement. "I'd say it's probably one and a half times the size of Pluto, but we're not sure yet of the final size." Talking to reporters, he said a name has been submitted to the International Astronomical Union and "I don't want to say what it is yet because we really want this name to get accepted and we want to make sure we go through all the proper channels," Brown said. The discovery almost surely will re-ignite the debate over what it takes to be defined as a planet. Many astronomers believe Pluto is more accurately grouped with other Kuiper Belt objects and should not be considered a planet in the traditional sense. The debate has even made it into the lyrics of popular song, "Planet X" by Christine Lavin (http://www.christinelavin.com/planetx.html). "Even I have promoted the idea that we should consider Pluto not to be a planet and a Kuiper Belt object instead," Brown said. "But historically, it's been called a planet for such a long time that I think we're never going to not call Pluto a planet. And that's fine. I think historically, we can call it a planet." But if Pluto is, in fact, a planet, "then anything larger than Pluto - I think we should draw the line there - anything larger than Pluto is a planet. Things that are smaller, I think we just call them typical members of the Kuiper Belt and they don't join this very special class of things that are planets." Brown said the discoverers were holding off making an announcement until after they completed their observations. But hackers found the discovery on a private website and trio decided to go public.